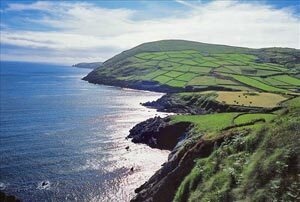 ABOVE: The Beara Peninsula in Ireland's South West is home to the Beara Way, a walking route of 125 miles or 201 km. Local loop walks are available for hikers in a hurry. Independent walking trips are popular with many visitors. The do-it-yourself approach works best if you've had experience as a rural walker in England or Scotland, and if you're familiar with Ordnance Survey maps and the use of a compass. It's also practical if most of your walking will be on easy paths near towns or villages where you don't have to worry about getting lost or falling off a cliff. Escorted walking trips offer the convenience and conviviality of traveling with a group (ideally not too large) and a knowledgeable guide. The walking-tour operator plans the trip, organizes lodgings and meals, and introduces you to the local history, geology, flora, and fauna (along with the best pubs). Ground transportation is usually included in the package price. Self-guided walking tours are another option. The tour operator supplies detailed route descriptions and maps, books your accommodations, and arranges for luggage transfers and local transportation when neeeded. Self-guided tours are an especially good choice for small groups of experienced walkers who want to travel together without the expense of a guide. On a recent walking trip with Fáilte Ireland, our group of seven journalists was accompanied by two guides: Chris Murphy, a Blue Badge Guide in Northern Ireland, and Linda Woods, co-owner (with her husband John Ahern) of SouthWestWalks Ireland in County Kerry. We spent our days walking and our evenings dining in restaurants and drinking in pubs. Normally I'm an independent traveler, but for a walking trip, I strongly recommend traveling with a group and an Irish guide. You'll learn more than you would on your own, you'll have access to places that you might not be able to explore independently, you'll enjoy the companionship of other walkers, and you'll avoid the hassles of driving or waiting for local buses in the Irish countryside. Tip: Some locations and itineraries are more strenuous than others, so know your preferences (and limitations) before planning a walking holiday. Photo: Holger Leue for Tourism Ireland.